Come and learn some free motion appliqué with Jenny, this technique is very versatile and can be used to embellish bags, pictures, quilts, clothes the list goes on and on. You will learn how to use your machines decorative stitches to apply to an applique piece as well as colouring with your machine or drawing with your machine. Please drop by and have a look at the samples on display at Cotton Rose. A class requirements list will be sent to you by email at time of booking. All fabrics purchased for the class will receive a 10% discount. Would you like to learn how to crochet? Justine from Creative Distractions will be teaching at Cotton Rose this year and she will guide you through the basic crochet stitches to get you crocheting in no time. 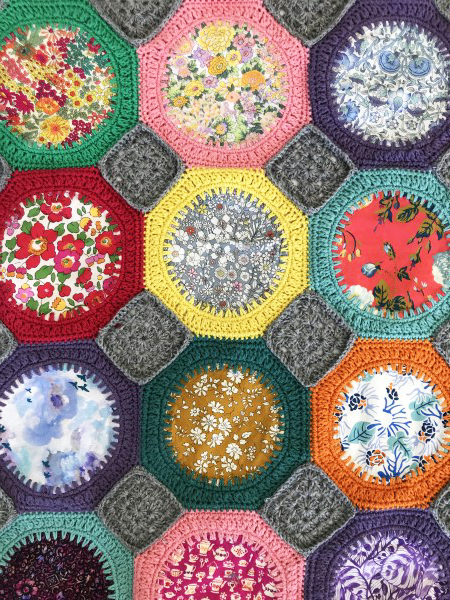 There are so many lovely projects worked in Crochet and this class will get you started. A crochet hook and ball of yarn is included in your class cost. All yarn purchased during the class will receive a 10% discount. I really enjoyed making this blanket and joining it using crochet. I have been playing with this technique for some years now and I am excited to finally have a pattern and be able to share this with others. It is a great portable project and actually works up quite fast. There are endless possibilities with colour and fabric, you can use lots of different colours or work within a colour palette like pink, blue, green ect. The class is run on two consecutive Thursday’s so that you have time to work on the technique and I can guide you through the next stage. I will also offer a third class at no cost if you need a hand joining. There is a class sample in the shop if you would like to have a closer look, a pattern will be included in your class fee. All items purchased for the class will receive a 10% discount on the day. I will have sock yarn available at the shop and you will receive a 10% discount on all yarn and materials purchased for the class. I can’t wait for this class, Justine has created a wonderful pattern. This lovely quilt is on display at Cotton Rose we have both here to show you. If you attended our beginners class last term this would be a fun class to increase your skills. Learn how to make this relatively easy quilt. Lois will show you the easy way to make these blocks. So effective but so easy. She will also give a demonstration on her quilting technique. Pattern included in class cost. A class requirement list will be sent to you two weeks before the scheduled class. Justine from Creative Distractions will be teaching us her Mobius knitted scarf, there are two options with this scarf you can make it out of one skein of wool or make a wider Mobius out of two skein’s. I can see this scarf being a big hit and a go to for the winter months, basic knitting skills required for this class. Come and spend three hours with us making yourself or a loved one something for winter. Class requirements: 5mm 100cm circular needles, 1 stitch marker and either 1 or 2 balls of sock yarn. The Spring Garden Bag is a very handy large bag and the technique used to make this bag is quite different and super effective. Please come into the shop to have a look at the two on display, they make great beach bags, project bags or just because bags. Lois will guide you through how to make and construct your bag. The class will be run over two consecutive Friday’s as there is a little bit of homework in-between. A class requirement list will be emailed to you two weeks prior to the class. All fabric purchased for the class will receive a 10% discount on the day. On the first Saturday of each month we would love you to join us at Cotton Rose to spend dedicated time to socialise and work on any projects you have on the go. This is a great opportunity to discuss patterns and also pick up different tips and inspiration. If you have always wanted to make a quilt this square quilt is a great place to start. Lois will guide you through the construction and quilting process. In the first lesson Lois will guide you through cutting the squares and sewing them together, in the second lesson you will be learning how to quilt. The choice is yours you can decide to make a table runner or a small quilt that would be great for a baby or lap blanket. Written instructions will be provided with the class, there will also be kits available on the day or please come and select the fabrics you would like to work with, a 10% discount on fabric purchased for your project will apply. Judy – “It is an incomplete day for me if I have not managed to find time to sew, play with fabric, contemplate new quilt designs or just dream about colour. It is such a part of me to notice everything around me in terms of design and colour, filing away ideas in the already overcrowded filing system of my mind”. “I have been designing quilt patterns and teaching for many many years. It is a great joy to pass on my skills and encourage budding quilters in this beautiful craft. I enjoy travelling with my teaching, all around Australia and now the world, I feel very lucky to call the thing I most enjoy, work and look forward to many more years and new opportunities”. I am super excited to say “Judy Newman” is teaching at Cotton Rose this March. Come and spend two days with Judy, she will be sharing with us her beautiful quilts and favourite techniques for piecing and Appliqué. If you would like to work on one of Judy’s new patterns please let me know I will be placing an order for the patterns and templates. A light lunch, morning and afternoon tea will be provided on both days. Fabrics purchased for the class will receive a 10% discount. This blanket was truly a pleasure to make. I am looking forward to sharing my first pattern with you. I will work through the pattern and the techniques I have used to create this blanket. The class will run over two weeks. The first class will be working on the circle and granny square, the second class we will work on the joining and any questions, there may be a tiny bit of home work with this one. I love working with fabric and yarn and have to say this is one of my favourite projects. Special Note: I have only used simple stitches for this project, if you have any questions please call and we can have a chat about it. Make a Dresden cushion in one class. Lois will share all her tips and tricks on how to make this delightful cushion. Once you have learnt this you may like to make the large foot cushion or add them to your next quilt project. Written instructions will be provided in the class for you to take home. Kits will be available or you may like to select your own colours, you will receive a 10% discount on all fabrics purchased for your class. Come along to Cotton Rose on a Saturday morning and spend some time creating fun projects with others your age. I would love you to join me and have some dedicated time to sew and work on projects as well as ask questions and perhaps try something new. I have made a Snuggle Pillow and would love to guide you through how to make this in our first class. Fabrics purchased for the class will receive a 10% discount.